Identity & Promotion Design Fiberworks Center for the Textile Arts was literally a cutting-edge, internationally acclaimed textile arts school in Berkeley, California in existence from 1973-1987, founded by Hungarian-born environmental sculpture artist, Gyöngy Laky. Dedicated to the preservation and advancement of the textile arts as a fine art form, Fiberworks fostered and developed individual artist's capacity for creativity, using textile as the principal medium of expression. The center's director, Maria Vella, commissioned David Curry, long before founding Design Latitudes, to design and produce the school's identity program, graphic standards, class schedule periodical and exhibition catalogues and posters. 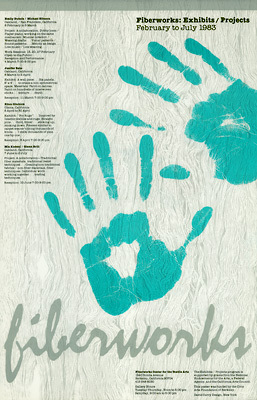 "For all of Fiberworks graphics, I employed imagery that was derived from the artists themselves to convey the sense of artistic interaction with textiles, as is exemplified by the logotype and this poster for their Exhibits/Projects program for 1983,"